Closet space is always scarce. No matter how much you think you have, you can always use more—especially at the lake, where beach towels and guest linens can take up a lot of real estate. But with a few changes and updates, you may be able to press every last square foot into service to maximize your storage options. Take a good look at your closets and ask yourself if you are really using the space to its full advantage. Are there large areas of white wall space with nothing on it? Are you using all the space up to the ceiling? How about the floor—is there space above your shoes that could be better utilized? If you have the means, one of the best ways to maximize your space is to invest in a professionally designed and installed closet system. There is a range of prices from semi-DIY to fully customized that will ensure no square inch goes to waste. 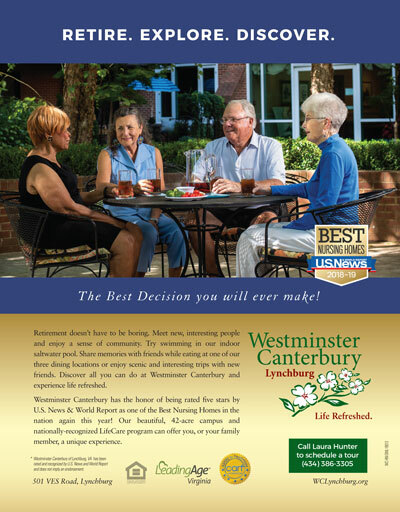 Begin by checking your local area for quality closet designers and call for a consultation. They can share ideas and price out a revamp of your space. 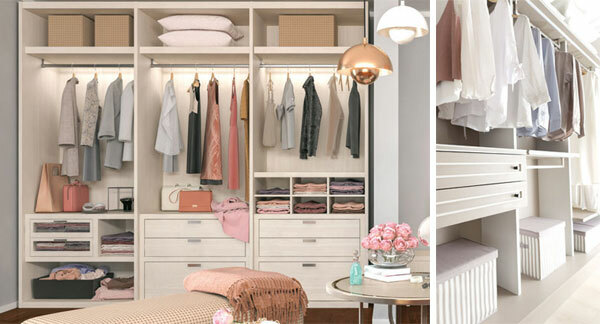 Alternatively, stock storage systems (like Elfa from The Container Store) are available online or from the local big box store, and can be installed either professionally or DIY to transform a mediocre closet into a fantastic wardrobing space. In addition to standard clothing closets, you may be able to convert additional space for a more needed use. Bathroom closets meant for toiletries can become handy linen closets for guests, with decorative baskets for holding washcloths and hand towels. Or make closets serve two purposes. Use the shelves for linens and add hanging door racks for soaps, and tuck smaller bins between towels for other toiletries. 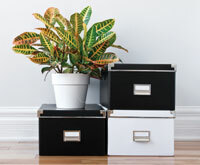 Search local stores for creative storage products. Try wire racks that slip under existing shelves so you can utilize the additional space. Add risers and stackable shelves to lower cabinets to create more tiered storage. Drawer organizers can be used in bathrooms to help contain clutter—especially if you have deep drawers where you can add another tray. If your house lacks closets, you can invest in built-in cabinetry to create elegant and seamless storage. That could be building out a unit against a guest room wall to store clothing and linens, while still leaving room for a mounted TV to create a media room when guests aren’t visiting. Or it could be creating built-in cabinets and drawers against a bedroom wall to store clothes. As long as you have suitable wall space and the funds, you can hire local craftsman to build out custom storage that will blend right into your home. Can you cut a hole in a wall and take some space from a garage or other empty space on the other side of the wall? One area that is often available is under the stairs, where drywall can be removed, and shelves and doors can be built right in. You can also build around a large window, installing shelving and cabinets on either side, and adding shelving under the window, or even a bench, which can be both a reading nook and hidden storage. Entryways may provide some unused space that can be repurposed for storage, including building a bench with hooks and shelving to store bags and other daily use items. 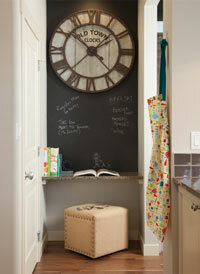 And of course basements often have an area where built-ins can be added. 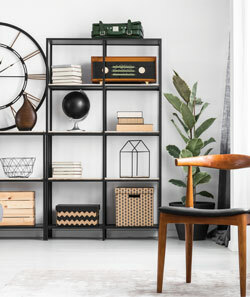 If custom builds are not in the budget, you can sometimes approximate the look and feel of Shelving units with large-scale furniture and storage options from retailers (such as IKEA) that will allow you to purchase a bank of identical closed storage shelves that can be attached to a wall for safety. The uniform appearance can give the look of custom cabinetry for far less. If you want the storage without the permanence of built-in or attached cabinets, consider purchasing furniture that doubles as creative storage. In bedrooms, you can buy armoires and wardrobes to hold clothes and other items, which allow you to move them around if you redecorate. Shelving units—especially ones with square, box-like openings—can be fitted with decorative baskets to store linens and towels. 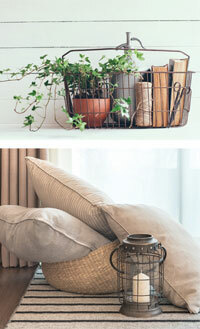 You can also use galvanized steel tubs or canvascovered storage boxes for a different feel, depending on your decor. These are especially useful in guest rooms and dens, where you may need to tidy fast and keep things looking crisp and uniform. You can also achieve a great design look with wall-mounted shelves, taking them all the way to the ceiling to maximize that vertical space. Place multiple shelves in unused or underutilized corners or nooks to create a floating storage unit that doesn’t take up floor space. Sometimes it’s not about long-term storage, but short-term solutions that help you contain your daily mess. Can you install a bank of hooks near an entrance to hang purses, coats and keys? That will help keep the clutter controlled. For off-season storage, definitely maximize rough attic space with plastic bins to keep clothing and other items clean and stacked. You may also be able to better leverage your garage or basement, especially with storage racks mounted to the ceiling. You can use sturdy, airtight plastic bins to store everything from clothing and seasonal decor to luggage and lake gear.